Randolph “Randy” Collard passed away on Friday, September 14th, 2018 at his home in Oronogo, MO. He was born to Arthur and Margaret Collard. Randy is survived by his daughter, Marcy Naeger, son-in-law, Brian Naeger and his grandchildren Alexander, Jacob, Ella, Lillian, Melia, Maxim and his beloved cat, Smokee. Randy always said that his daughter, son-in-law and grandchildren were his world. They provided him with the love and laughter that gave purpose to his life. Likewise, he provided his grandchildren with unconditional love, constant laughter and endless memories of his antics, his practical jokes, and his silliness. Randy wore his heart and on his sleeve and always made it known how proud he was of Marcy, Brian and his grandchildren. His love and affection for them knew no bounds and he never hesitated to tell anyone who was willing to listen. He beamed with pride over the legacy Marcy created for him. 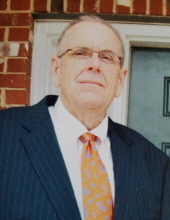 True to the calling of Jesus, Randy loved all children, including his nephews, great nieces and nephews, the children and grandchildren of friends and neighbors and even those children whom he met in everyday life. “Let the children come to me, and do not hinder them, for to such belongs the kingdom of God. Truly, I say to you, whoever does not receive the kingdom of God like a child shall not enter it.” Luke 18: 16-17 Randy is also survived by his brothers James Collard (Karen) and David Collard (Nancy), cousin Jan Schneider, uncle Freddie Schneider (Mary Ruth) and many, many other family, friends and neighbors for whom he greatly cared about. His passing from this Earth was unexpected but his family takes solace in knowing that he is reunited with loved ones that have gone before him and that he is able to sit side by side with his dad as they cheer on their beloved Cardinals together again. Services will be held on September 29th from 10:00 a.m-11:30 a.m at Saint Paul’s United Methodist Church in Joplin. You are invited to drop by and share your memories of Randy. In his honor, please feel free to wear red or your favorite Cardinals baseball apparel. To send flowers or a remembrance gift to the family of Randolph Collard, please visit our Tribute Store. "Email Address" would like to share the life celebration of Randolph Collard. Click on the "link" to go to share a favorite memory or leave a condolence message for the family.